If you are interested in being part of the committee of the NZHS, do let Helen know (preferably at least 24 hours prior to the AGM!). In our constitution, we don’t have a written deadline for this, but in terms of keeping the AGM brief it is good if there are no surprises on the day! The outgoing committee has spent some time discussing how best to use the capital that the Society has had invested for a number of years. The Harp Society is sitting on funds raised from a conference held in Wellington in 2004. The question is, do we try and hold another conference? Or use the money on other projects to make the Society more relevant to harp players in NZ today. If you have strong opinions about this, I really encourage you to stand for nomination for the next committee, and be part of this discussion! 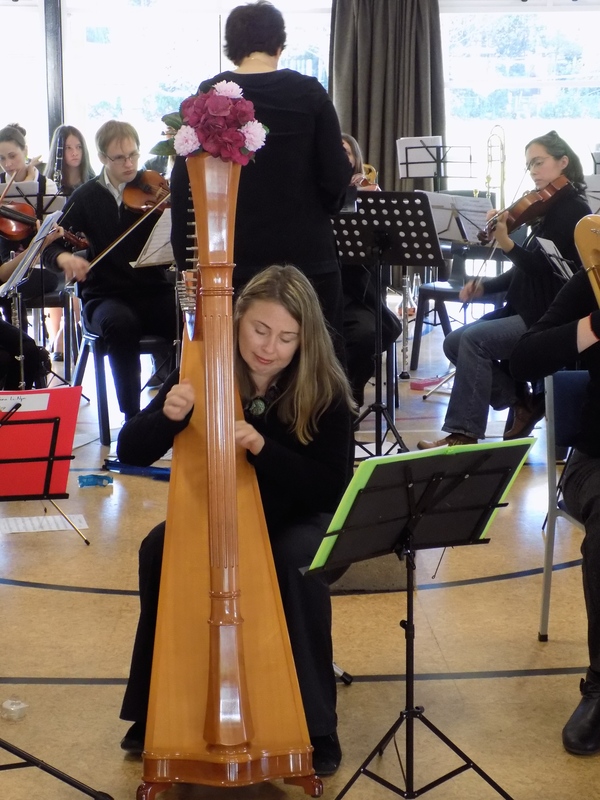 Christchurch Harp Orchestra’s midyear concert this year was a collaboration with the Garden City Orchestra. 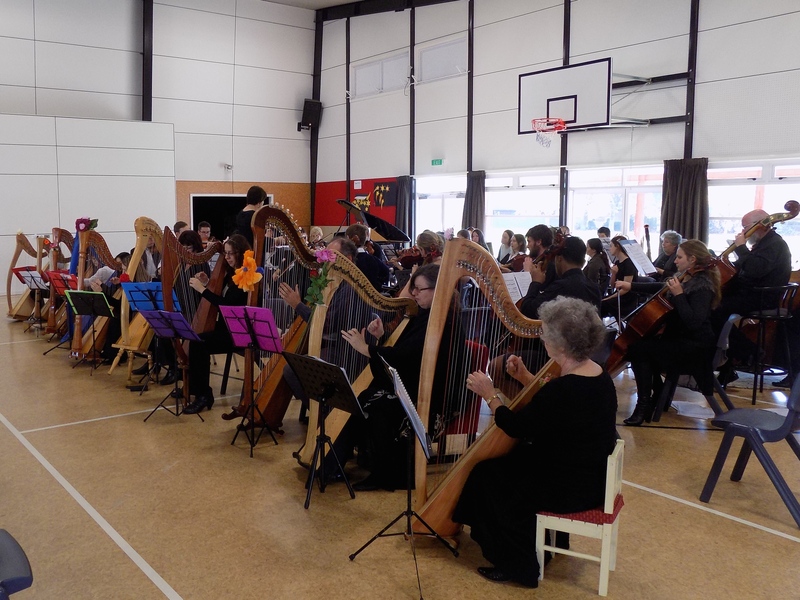 Held on 24 May at Avonhead School, the Sunday afternoon concert attracted a big crowd of all ages and filled the school hall. Garden City Orchestra calls themselves ‘the friendly orchestra where tea is as important as the music’, and their director Beth Cohen does an amazing job conducting and serving trays of chocolate slice during the interval! The Harp Orchestra played some short ensemble pieces: Brian Boru’s March, Carolan’s Welcome and the Dill Pickle Rag, arranged by Helen Webby. Then we combined forces with Garden City Orchestra to play the famous Intermezzo Sinfonica from ‘Cavalleria Rusticana’ by Mascagni. This instrumental piece from an Italian opera set in Sicily was also used for the final scene of the Godfather III movie, when the daughter of the Mafia boss is killed on the steps of the opera house in Palermo. It is intensely beautiful, emotional music, and was a lot of fun to play with twelve harps sitting at the front of the orchestra, decorated with flowers to celebrate the occasion. The conductor Beth said it made her feel like Marlon Brando! The original harp part of Mascagni’s Intermezzo Sinfonica is a series of chords in F major, and fits beautifully on lever harp. I did chop it up in to easy and intermediate parts however. If anybody would like to use these parts for school orchestra or harp orchestra, I am very happy to pass them on. Harp Orchestra Christchurch meets once a month, and plays two concerts a year. New players are warmly welcome, and parts are arranged for easy, intermediate and advanced players. Look out for our end of year Christmas Charity Concert on Saturday 28 November, 7pm. Venue for concert is Hohepa Canterbury, 23 Barrington St. The Auckland Council is looking for established and up and coming artists across a range of genres to perform for Music in the Parks 2016. As many of you know World Harp Congress 2017 is in Hong Kong, it should be a wonderful experience for those lucky enough to be able to attend. Planning is already starting for the 2020 WHC and bids are going in as to where it will be hosted and this is influenced by voting (which you are invited to do) but you need to sign your support of location by 20th of July. I believe Berlin may also be bidding but have not found a link to the bid yet. Thanks to Anna Dunwoodie for the above information on the bidding. La Fête de la Musique: 21 June! "La Fête de la Musique is a lively music festival held every June 21st in more than a hundred countries and over 460 cities around the world; so now also known as International Music Day." Some of our local Alliance Française organizations are looking for artists (amatuer and professional) to get out and play! Although you by no means need to go through them, to get out and about. Here are a couple of links to follow based on geographic area, if I didn't cover your area please feel free to add a news item with the information! From what I can see Wellington and Christchurch are taking a different approach, but perhaps someone knows an organization coordinating something? Add a comment if you do! Why Login to the Website? There is a lot of the website that is for members only! You can sign up to be notified of any new activity on any forum (public, members only, tips and techniques) by clicking "subscribe". A new website about composing for harp in which some members may be interested. www.composingforharp.com, the new website for harpists and composers! This new source includes a method for composers in 9 videos about harptechnique and -writing, a library, still grwoing, with a hughe number of pieces written for harp from the last decennia, colums from well-known harpists and composers and the possibility to connect and ask questions via our Facebook forum and contact. Over the last three years we have been working hard on this website, in order to create a better understanding between composers and harpists. We would like to introduce the site to all of you worldwide in the hope that this new source is beeing used and brings us many great new pieces, playful and playable scores! The videos are often seen already and we have almost 500 followers on Facebook, maybe you are one of them already! If you like the site, please spread the word about it, like composinforharp on facebook or write us with questions and suggestions for more pieces and ideas!